Et jordskælv og deres efterskælv er en rystelse af jorden og dens overflade. Disse kan være forårsaget af, at kontinentalpladerne bevæger sig, vulkanisk aktivitet, eller menneskabte hændelser så som atomvåbenforsøg, eksempelvis detn ameri-kanske Operation Gnome 1961, eller olieboringer. Jordskælv, udgør også en fare for atomkraftværker, som i tilfældet med Fukushima-katastrofen i 2011. Seismologi, videnskaben om rystelser i jorden, anvendes både til at måle atomvåben-forsøg og til måling af jordskælv. An earthquake is a shaking of the earth and its surface. These may be caused by the fact that the continental plates move, volcanic activity or man-made events such as nuclear weapons test, for example, the US Operation Gnome , 1961, or oil drilling. 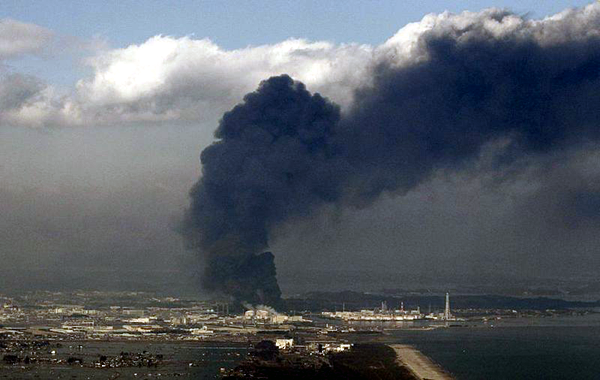 Earthquakes present also a danger to nuclear power plants, as in the case of the Fukushima catastrophe in 2011. Seismology, the science of vibration in the soil, are used both to measure nuclear weapon tests and for the measurement of earthquakes. Andrews, C. F.: The Indian earthquake. - London : G. Allen & Unwin Ltd., . CRS: Civilian Nuclear Waste Disposal. / : Mark Holt. 2015. CRS: Earthquakes: Risk, Detection, Warning, and Research. / : Peter Folger, 2013. CRS: Human-Induced Earthquakes from Deep-Well Injection: A Brief Overview. / : Peter Folger ; Mary Tiemann, 2014. "Historic Earthquakes and Earthquake Statistics: Where do earthquakes occur?" Engdahl, E.R., and A. Villaseñor, Global Seismicity: 1900–1999, in W.H.K. Lee, H. Kanamori, P.C. Jennings, and C. Kisslinger (editors), International Handbook of Earthquake and Engineering Seismology, Part A, Chapter 41, pp. 665–690, Academic Press, 2002. Engdahl, E.R., R. van der Hilst, and R. Buland, Global teleseismic earthquake relocation with improved travel times and procedures for depth determination, Bull. Seism. Soc. Am. 88, 722–743, 1998. A study of recent earthquakes. / : Charles Davison. - London: The Walter Scott publishing co., ltd., 1905. --I. Introduction.--II. The Neapolitan earthquake of December 16th, 1857.--III. The Ischian earthquakes of March 4th, 1881, and July 28th, 1883.--IV. The Andalusian earthquake of December 25th, 1884.--V. The Charleston earthquake of August 31st, 1886.--VI. The Riviera earthquake of February 23rd, 1887.--VII. The Japanese earthquake of October 28th, 1891.--VIII. The Hereford earthquake of December 17th, 1896, and the Inverness earthquake of September 18th, 1901.--IX. The Indian earthquake of June 12th, 1897.--X. Conclusion.